IT CAME WHEN YOU SAID IT WOULD AND HE LOVED IT. IT WAS JUST RIGHT TO WEAR IN FRONT POCKET. I WILL BE ORDERING MORE CHRISTMAS......MY GUY'S DESERVE THE BEST WALLET AND THIS IS IT....AWESOME!!! Awesome, awesome, awesome, awesome!!!! Do I need to say more?? Got this one for a friend and I got the Doctor for me. 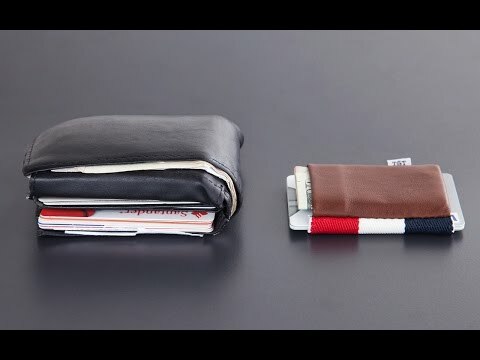 We are front pocket wallet guys, and this is a perfect size. Love it!!! I ordered this as a novelty item, but it immediately became an everyday staple...my wallet of choice. I carry 9 plastic cards and a couple of business cards...and could easily add another 6 plastic cards if I was so inclined (but I am not). In the separate leather money pouch, I currently have about 15 bills, but would have no problem adding more. This wallet is very functional and so light, I don't even feel it in my pocket. Some reviews mentioned that it was tough to access the cards because the wallet secures them so tightly. However, if you push one end of the cards about a half inch, you can easily flip through and access the card of your choice and then push the stack back after replacing the card. Time will tell as to how long it will last (I have had mine only 2 weeks), but it looks to be extremely well-stitched...AND...USA made! The only thing that might make it better is RFID blocking technology, but I am still giving it 5 Grommets. Nice job! 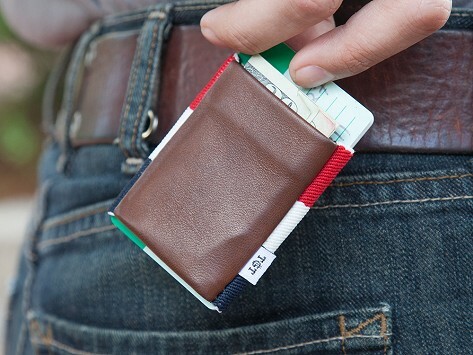 Very good alternative to a bulky wallet. Don't expect it to hold a lot but this is a great solution to bulky wallets. Very good for a few critical cards, your license and a little cash. I bought the Men's Minimalist Wallet for my husband and he loves it. He is very picky about some things and the size and fit of a wallet is one of them. He likes this being small & he can put it in his front pocket. Great job to the inventors! Definitely recommend this product! It was difficult to get the driver's license and credit cards into the elastic band at first, but within a few days it has loosened up enough to be effective. In general, I really like it ... and my wife wants one too. My husband likes this wallet but has commented that it's just a little too compact to hold the basic cards (about 4) & cash he needs daily. He's still using it though, just wishes it would stretch a bit more.